The XDISP Display Panel provides a remote display facility for all automatic SteelPumps models. It indicates the presence of a power supply to the pump and the activation status of the pump (whether the pump is idle or pumping water). 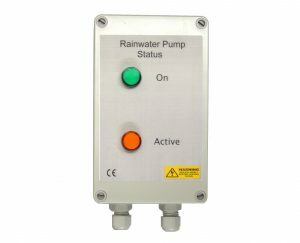 As well as monitoring the activity and status of your SteelPump it can also help determine frequent restarts due pipe leaks or faulty float valves (ballcocks). The green “On” light indicates a power supply to the pump. This light is constantly energised as long as there is power to the pump system. It indicates that the pump is ready to operate automatically as and when required, and that there has been no disconnection from the supply or trip of any circuit protective device (MCB or RCD). The amber “Active” light shows that the pump is currently operating and pumping water. Under normal conditions the pump will switch on when there is a demand for water and stay on as long as the outlet or appliance continues to draw water. The “Active” light therefore indicates the frequency of pump startups, failure to start, or continuous running, alerting the user to problems which may otherwise cause premature pump failure. The control panel must be installed in a sheltered location. It can be mounted outside as long as it is protected from the weather for example in a barn or covered area. Four recesses (one in each corner of the panel) allow the control panel to be easily attached to a wall or suitable support without compromising its ingress protection rating. Installation requires the replacement of the power supply flex to the pump with a 4 core cable. To ensure this cable is fitted when a new pump is purchased use product reference XDISPFITT. Full instructions are provided. Suitable circuit protection must be installed including a suitable earth, overcurrent protection, and residual current protection at 30mA, ideally on it’s own circuit, but always in accordance with BS7671 and applicable regulations. Wir haben Ersatzeile für die Pumpe X-AJE80G (X-AJE80P oder Integra INOX) und andere SteelPumps, welche weitgehend in Deutschland und Europa von Graf verkauft werden, auf Lager und können sie, inklusive Versandkosten nach Deutschland liefern. Wir verfügen über deutsche Sprachkenntnisse und können alle E-Mails in Deutsch beantworten, obwohl Verzögerungen möglich sein können. Official distributor of the Italian SteelPumps Evolution water pumps and specialist stainless steel pumps in the UK and Ireland since 2008. Full stock of SteelPumps spare parts to repair and service SteelPumps. We post SteelPump spare parts to anywhere in Europe. Stay up to date with our latest products and offers with our monthly newsletter.